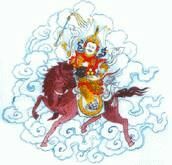 The Dorje Kasung is an organization within Shambhala modeled on the ancient tradition of dharma protectors. Its members are trained in protecting the space in which practitioners are able to hear and practice the teachings. The protection extends to the teacher who presents the teachings, the teachings themselves, and the community that practices the teachings. The Akron-Canton Center has an active Dorje Kasung squad.